Decorative towel rail. Made from DIN2395 steel. Depth, wall to front, 85 - 105mm. 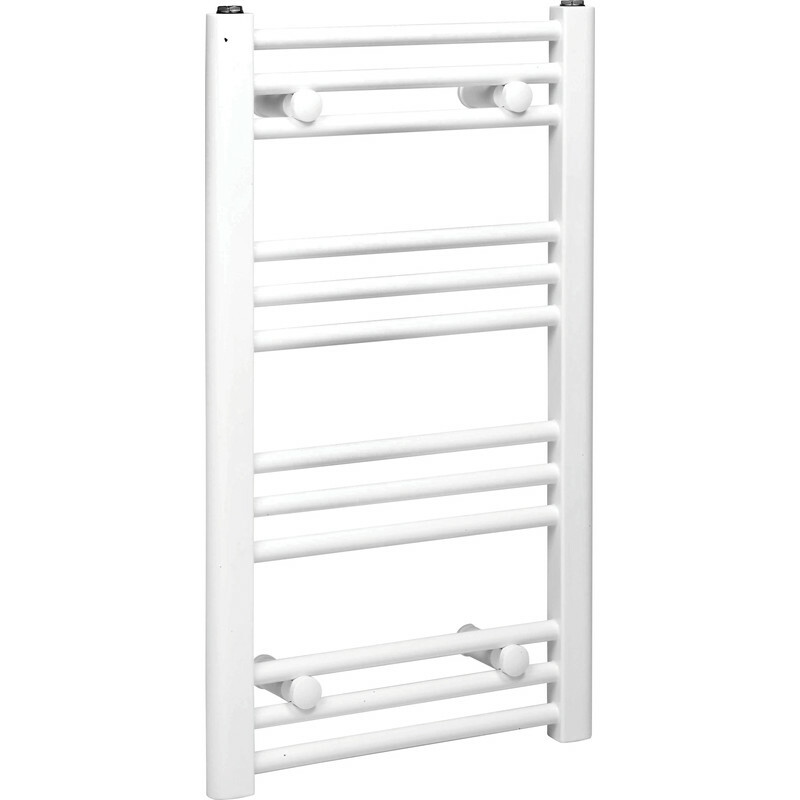 White Flat Towel Radiator 700 x 400mm 893Btu is rated 3.5 out of 5 by 8. Rated 1 out of 5 by Unimpressed01 from Damaged but nicely packed! Sadly the radiator was bent at one end, prior to being nicely packaged so no clue until unwrapped and ready to instal! Shoddy quality and absolutely no quality control. Last time TS catch me like that! Rated 1 out of 5 by Bill 7 from Damaged Screw thread was poor quality,could not tighten up. Exchanged product and was much better. Rated 2 out of 5 by Experienced DIYer from Not the best experience! I have fitted three of these towel rails previously with no problem and they all worked fine. This was an exception. One of the tappings was damaged and had to be re-tapped before a plug could be fitted. Another seemed to be tapped oversize so that the normal tapered connection screwed in much too far; it required a specially adapted fitting to seal. Had Tools station not been 20 mules away it would have gone back as defective but fortunately I had the means available to fix it. Guess it was built on Friday afternoon at the factory! Rated 5 out of 5 by Rich 1969 from Great value for money Looks great and very useful, gives out more heat than expected looks good and has made the utility room more useful and comfortable. Rated 4 out of 5 by alan2938 from White Flat Towel Radiator I had this installed by a builder, looks OK and works well. Rated 5 out of 5 by Bobo123 from Smart product Looks great and is very warm.